President Mugabe is currently being held at home as the Army has strategically taken over various positions on the streets of Harare ! In a dramatic televised statement in the early hours of Wednesday morning, an army spokesman denied that a military takeover was underway. 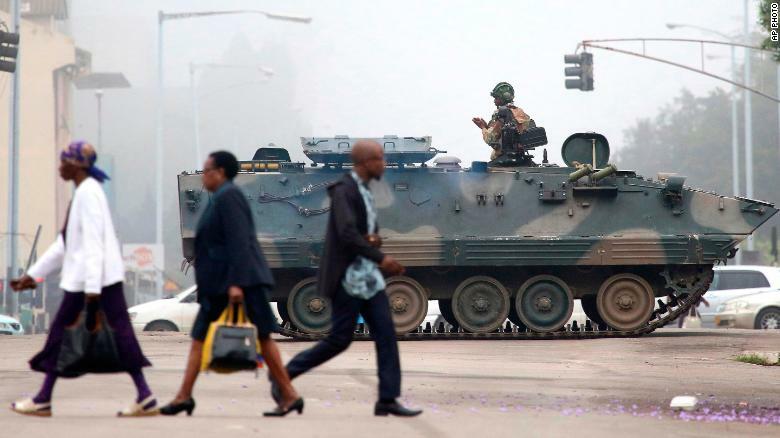 But the situation bore all the hallmarks of a coup: The army was in control at state TV in Harare, there was a significant military presence at the international airport. Soldiers on Wednesday took over the headquarters of the state broadcaster ZBC and blocked access to government offices, but the army says this is not a military take over. This is an internal party takeover ‘to refresh the political system, with the army’s support. Zimbabwe Major General Sibusiso Moyo reading a statement at the ZBC broadcast studio in Harare. The president has ‘technically’ not been deposed. But people are being arrested, the G-40, which is Mugabe’s political faction has been targeted and many have been arrested. This situation flared up after Mugabe sacked his vice president, a ‘friend of the army’, Emmerson Mnangagwa, a former Defence Minister, spy chief and veteran of the war of independence. President Robert Mugabe, who leads the ruling Zanu-PF party, is safe, South African President Jacob Zuma later said Mugabe was confined to his home. Finance Minister Ignatius Chombo among those reportedly arrested. But as yet, there is no official word from the government or the Mugabe family as to their whereabouts. The situation on the ground is not relatively peaceful at present however some foreign hotel guests in Harare were leaving. However no real panic has set in yet as airports are open as usual.